Though this article from Yahoo! 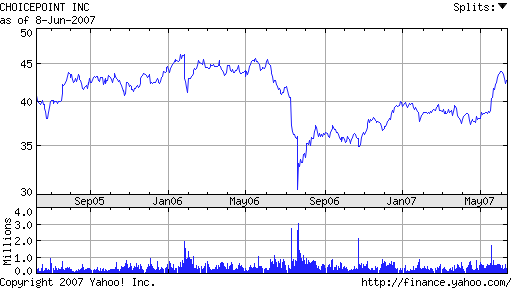 Business is not about the privacy problems that plagued ChoicePoint and that made the company the poster boy for privacy breaches, I found it interesting to take a look at the chart of the company's stock value. In the last twelve months, the company's share value has slowly increased to barely recover the value lost by the high-profile breach. The total value lost between then and now is staggering. See: Out of the Gate: ChoicePoint Jumps: Financial News - Yahoo! Finance. I think you're missing a point or two about their stock value. ChoicePoint had recovered all of the share price loss caused by the breach by the end of 2005. Regular business issues kicked in to drive the stock lower in 2006, including the sale of some businesses and the failed sale of another. Plus, look at where their revenue comes from - mostly home and auto insurance and that market has been taking a beating in the US over the past year or two. It sounds good to claim companies that get hit by big security and privacy issues get tagged in the investment markets, but the facts just don't support the conclusion.